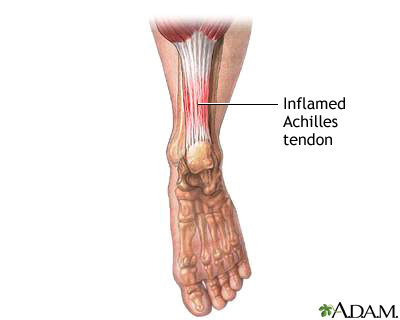 Degenerative tendonitis is a gradual degeneration or deterioration of the Achilles tendon. This condition is sometimes referred to as tendinosis or tendinopathy. The Achilles tendon like all the other tendons of the human body relies on a steady blood flow to stay healthy. If you suffer many tears in the Achilles tendon over time these tears will prevent proper healing and the tendon won’t repair, as it should. If the tendon does not repair properly than the blood supply will not be as it should and the tendon will slowly deteriorate. This causes a weakening and thickening of the tendon, which will prevent normal movement and can lead to pain and an inability to move and to perform normal tasks. Degenerative tendonitis in many ways is just like any other tendonitis with the difference that it occurs over a long time and that it gets progressively worse. Those that have degenerative tendonitis first receive the diagnosis sometime between age 35 and age 45. It occurs typically among those who have not had an athletic lifestyle. The symptoms of degenerative tendonitis are pain the tendon and the leg, especially as you push with the leg and the Achilles tendon will be swollen because it is thicker than it was before. Degenerative tendonitis is treated pretty much like other tendonitis in that you are treating the pain and use physical therapy, stretching exercises, a brace or boot and immobilization of the leg for rest in order to minimize the damage and to help rest and then allow for a return to use as much as possible. The difference is that it is understood that the body part will not be returning to normal function, as this is a degenerative form of tendonitis. Treating degenerative tendonitis is difficult due to the circumstances. Surgery is not always necessary as there are those with the condition who manage to cope with the pain and limited mobility without having to resort to the surgery. Physical therapy is key to avoiding surgery. A boot or foot brace is also critical tools for learning how to help your Achilles tendon to cope with the demands of the condition. If however physical therapy and a brace or boot has been used for a prolonged period of time without relief than the surgical option must be entertained as a viable method of returning the individual to a life where they can be without chronic pain.